It is great any day of the week, but particularly on Friday. After a long week of monotony and tired mornings, crappy work and too much coffee, what is better than relaxing with a good drink and some salty nibbles at your favourite watering hole? Pretty much nothing. Last Friday, Adam and I stopped in for a libation at The Auction House after a chilly day of poking around downtown. Located on Argyle Street, the newly opened pub has taken some of the Dome’s real estate and turned the dark corners of the club into a bright and clean establishment. The Auction House is bright, white, and decorated like I imagine a British pub or auction house to be; its white crown mouldings and classic lighting give the newly renovated space an old world feel. The dark wooden furniture and plush leather banquets are inviting and mirror a country estate, while its red accents modernize the space. There are accommodations for a large group looking for a big table, as well as cozy booths that welcome couples in from the cold. We seated ourselves and were greeted by a friendly server who took our drink order. Though I am usually not a big fan of mojitos, the server convinced me to try the feature cocktail, a ginger beer mojito. Adam went with the happy hour special, a dollar off his draft choice of Propeller IPA. The huge 21-ounce glass of draft was only $6.75! I am ashamed to admit that I don’t really like mojitos, it seems like everyone in the world loves them, however, if they all tasted like this one, I would drink mojitos more often. It was sweet and refreshing, and not too minty, the ginger beer was a great twist. There are great drink options at the bar: lots of local beers on tap, classic cocktails, and the best of both worlds, beer cocktails! Keeping with the true happy hour spirit, we stuck to drinks, but while perusing the menu, I couldn’t help but notice the Deep Fried Cheese Curds and I just had to order them. I mean deep-fried cheese, come on! 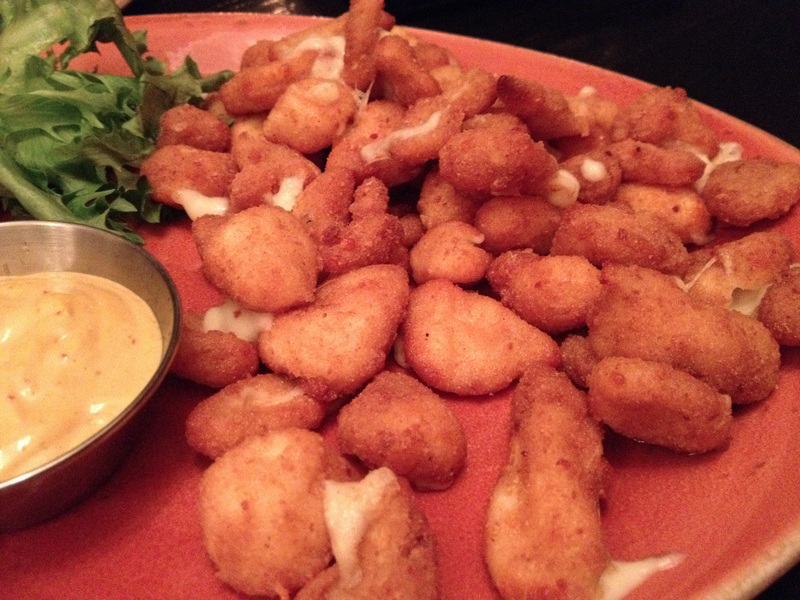 The Deep Fried Cheese Curds were so freaking delicious I could have eaten the whole plate myself! They use the good curds, the squeaky ones, and they came with a chili-lime dipping sauce that added a great punch (not that the curds even needed it). We didn’t get much to eat, but there is a large menu that caters to all. There are the classic bites to share like mussels and nachos, as well as some interesting pub twists like the Irish Poutine and Scotch Eggs which run from $8-13. The entrees are equally diverse with a selection of sandwiches, stews, fish and chips, and even a jambalaya ranging from $11-19. The coolest part of the evening was definitely the auction! Yes, they have real live auctions right in the pub! 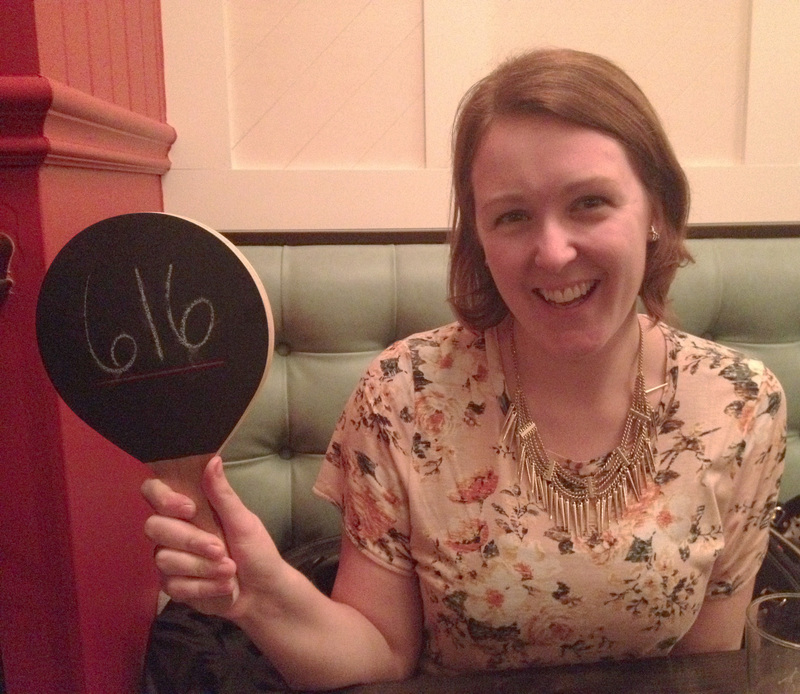 When I first entered the pub, I thought the chalkboard auction paddles on all the tables were to help the servers out, which I admittedly scoffed at. But when the server/auctioneer got up to his podium and started to auction off the feature cocktail, I couldn’t help but get excited. It was really cool! They have multiple auctions daily, and up for bids are drinks, appetizers, and other treats. By the way, all the proceeds of the auctions go to charity, which is awesome! 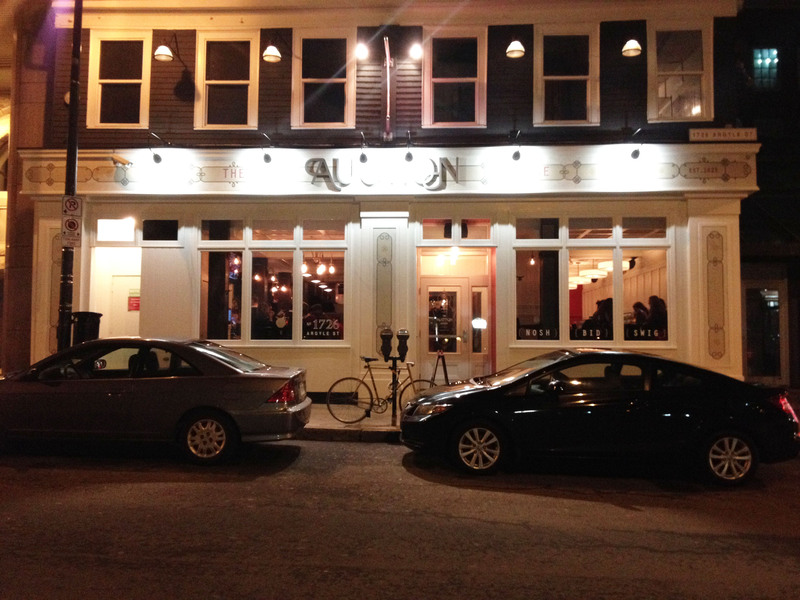 We had a great time at happy hour at The Auction House, the service was great, the drinks plentiful, and where else in Halifax can you bid on booze? Check it out! Cost: For this particular visit, an appetizer and 4 drinks only ran us about 34$ before tip…pretty good for happy hour! 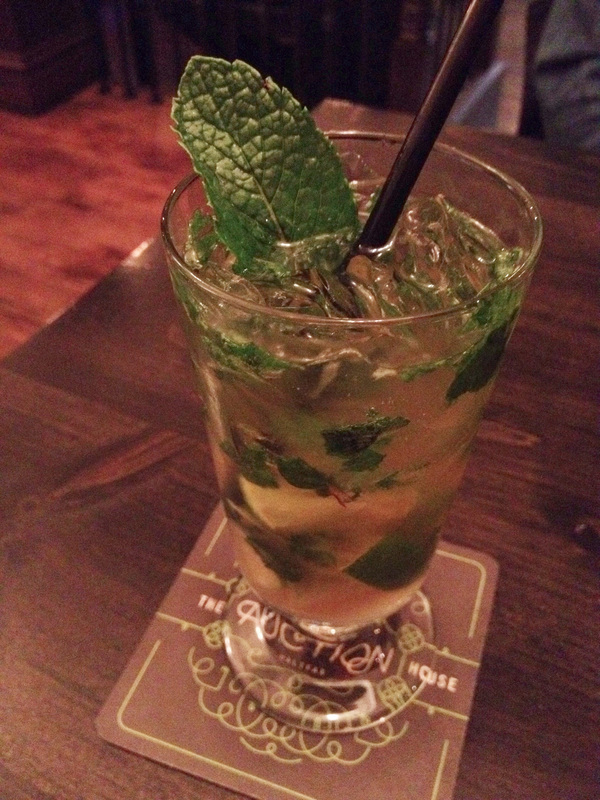 Things I liked: The auctioneers, the beautiful pottery dinnerware, and the mojitos. Things I didn’t: Slightly over-lit, but we all know how much I appreciate mood lighting. 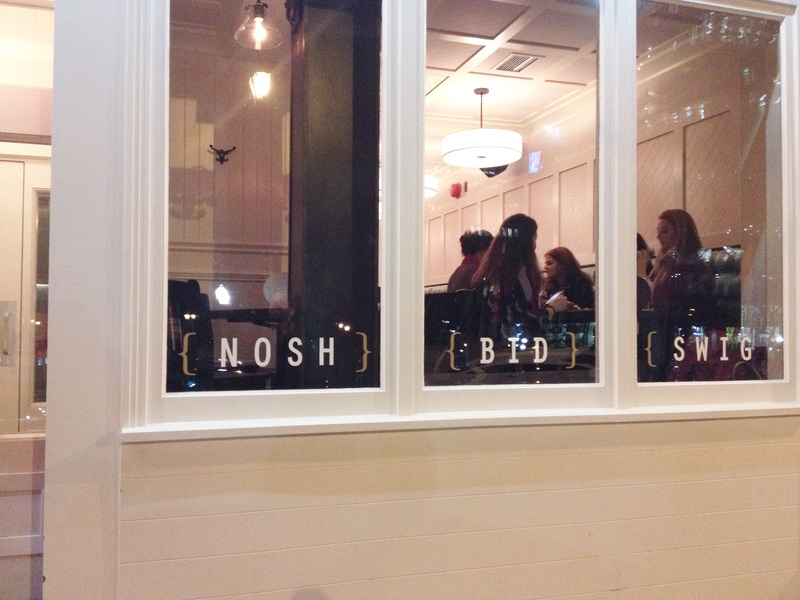 Best Place to Sit: In the cozy looking booths, or right in the window for great people watching along Argyle. What To Order Next Time: A full meal!! Definitely will be trying the Irish Poutine and the Haddock Po Boy.